Last night, I wasn't sure I'd be able to post this update today. I had a few Braxton-Hicks contractions that were very strong, lasted well over a minute, and seemed to be coming at some sort of interval. For awhile it seemed like they were every 10 minutes, then maybe every 8. But the thing is, the whole time I was having them, I was moving around -- cleaning up the kitchen after dinner, running over to Jewel for a bunch of booze*. Actually, a similar thing happened the night before during the post-dinner cleanup and some laundry-putting-away, although not quite as intense. Both nights, the minute I sat down, the contractions stopped. Most people -- including my midwives -- call that "false labor." But I like dear Dr. Sears' term better: "prelabor contractions." I agree with the explanation there that all the Braxton-Hicks contractions you experience before active labor begins are slowly helping the cervix thin and dilate; they're not for nothing. So anyway, besides the intensification of the "prelabor contractions," I also had the tiniest streaks of bloody show yesterday. Barely noticeable. I don't think I've ever passed a really recognizable mucous plug with any of my pregnancies, so I don't know if that was it or what. With Nutmeg, it was five days from my first bloody show till the birth; with Pebbles, I don't think I had any until my water broke. Besides the contractions and whatnot (don't you like the word whatnot better than, say, "secretions"? I sure do. 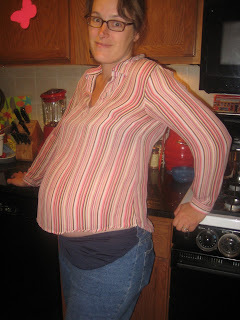 ), I've been feeling what I typically do in late pregnancy: That feeling of heaviness and pressure in my pelvis. No surprise, eh? I have to pee almost ALL the time. I laugh to say this, because if you look at me it would be obvious, but yes, I feel bloated. I feel kind of like I have my period. And I still have heartburn and indigestion even though the baby's lower and not torturing my rib cage as much. Otherwise, I'm feeling OK. Tired enough that I need to take a nap every afternoon when Pebbles is napping, and Nutmeg has been just great about that. She even asked me yesterday, when I was puttering around getting a few things done, "Why aren't you taking your nap?" She's been on a reading binge, going through a chapter book just about every single day, so she doesn't mind if mom lies motionless for an hour. She often does her reading on the bed with me which is pretty cozy. But not so tired that I haven't been able to get anything done. I mowed the lawn yesterday. I'm (just barely) keeping up with most of my blogging obligations. There has been some progress on the pre-baby to-do list, although not ENOUGH progress considering that baby might show up any day. We got the baby gear from our friends, I packed 2 hospital bags (one with clothes, etc., and one with snacks, drinks and comfort measures), we blew up the birth ball but found out it won't stay inflated because I think the kids put holes in it, Epu washed the baby clothes and they are waiting to be inventories and put away once a drawer is cleared for them, I shopped for and packed labor supplies like massage oil, drinks, jello, I bought more pregnancy tea and have been drinking it (but it gives me heartburn or maybe that's the lemonade I mix it with ok obviously it's the lemonade but the lemonade makes it taste good), I've been listening to hypnosis tracks on my iPod almost every day, I got some baby bottles as a gift (thanks, Bonneys! ), and we wrote, printed and packed multiple copies of the birth plan. Sure, that SOUNDS like a lot. But remember this is a kid without a nursery and I can't even find the time in my day to clear out a drawer for the poor little thing. But Epu has the next two days off from work for the holiday weekend, so if we don't have the baby tonight maybe we'll get a few more things done. At any rate, he'll be able to tag along to the midwife again tomorrow which will be nice. Oh, we also went to that family wedding, and it was very nice, but that's a whole other post. If I get around to writing it. * Nothing like the sight of a hugely pregnant lady buying a cart full of liquor at 10 o'clock at night, right? The reason for the booze run was not that the midwife's "If you think you're in labor" sheet advised to try one ounce of hard liquor to stop "false labor" (it totally DID advise that, though, which I think is awesome), but because I had a $25 rebate form that required certain alcohol purchases to be made by June 30. I sent it in today; too bad I hadn't thought to put THAT on my pre-baby checklist or I'd have another thing to cross off. Yeah, nobody tells their kid their birth story with "secretions" included, do they? Nothing like, "So Mommy had you right here [pointing] in her belly for nine whole months, and she was wondering when you might come, then one day, she noticed..."
I would have loved to see all the other shoppers....stopping, staring, whispering behind their hands. I bet you were a sight! Kori, You know, I think I've caught Epu telling Nutmeg her birth story that way, and I was frantically making the "cut!" sign across my throat. After 5 years the man still does not understand or care that little kids will repeat everything they hear. prelabor contractions--brilliant! gotta love dr. sears. i've been thinking about you everyday and wondering how things are going. much love to you all as the big day rapidly approaches! i could never figure out if I had braxon-hicks contractions and since you thing they dialte the cervix ready for birth, maybe I never had them b/c i have 12/24 hrs or labor and I only dilate up to 4cm so my body never dialate until active labor starts...or I am just clueless and think the B/H is only the baby moving. lwwb -- Yeah, I really wonder if you ever had any because it seems like one could not miss these things. They are very strong. But I think they get stronger with each baby, just as afterpains do. I know that with Nutmeg, I did not realize they were contractions until I was on a monitor and the doctor asked me, "Did you feel that contraction?" Don't worry, they've got birthing balls in the ABC rooms. Here's to hoping you can see fireworks from your recovery room. yeah, i agree that the bh contractions are way worse with 2nd (and, i imagine, 3rd) pregnancies. with g, i only had slight, painless tightening. with h, i felt pretty intense bh contractions at times. Oooo! I'm so excited to hear all about you new little one within the week! Gaaa! Maybe I'm projecting, but it's just so... EXCITING! He's a lucky little guy.